Your high school student is nearing the end of their educational path, and it’s almost time to graduate. They’ve worked so hard to get through their classes, and you’re one proud parent. To celebrate, the grad party should be awesome. Flowers are a great way to decorate for a party, but choosing the right ones can be difficult. Here are some tips to make your decision easier. Before picking the flowers, you should start researching local florists to see what styles they have. Most florists have a portfolio of their work that you can browse through to get a good idea. Check out ours, as we are the florist in Manassas Va that locals love. There are plenty of things you need to buy for the grad party, like food and other decorations. Before you decide on the flowers, you want to go to the florist knowing how much you want to spend. This will help determine what kind of flowers you can get as well as how many. There will be other decorations at your party, like tablecloths, napkins, balloons, etc. What colors scheme do you want for those things? Sticking with your child’s school colors is a great option, but you can branch out too! While flowers can come in different colors, it’s hard to make a rose look purple. Decide what color(s) you want, and then figure out what type of flowers come in those colors. 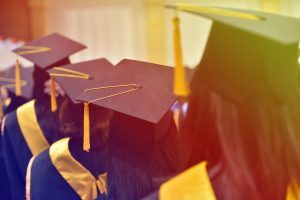 Although graduations usually take place in May or June, some people wait until the end of the summer to throw their graduation celebration. You want to keep in mind what will be in bloom when you have the party. Out-of-season flowers may be difficult for florists to find, and they typically come at a higher price. For the summertime, anthuriums, carnations, chrysanthemums, gypsophilas, lilies, magnolias, peonies, roses, and sunflowers are typically in bloom. Roughly 69% of Americans report that the sight and smell of flowers can improve their mood. So when you decorate your child’s graduation party with gorgeous flowers, everyone will have a great time. Consider the season, color, budget, and florist when deciding on your flower selection. You can even let guests take some flowers home as a party favor they can decorate their homes with when the party is over.